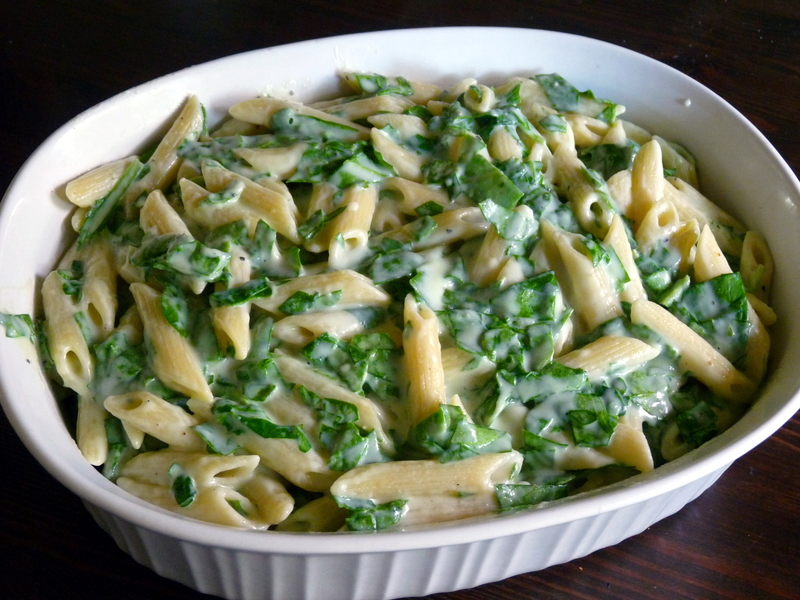 Florentine pasta is pasta with spinach and a white sauce. There can be other things, too, but if you order something from a menu that says “florentine, ” you can be pretty sure it will have spinach and white sauce. 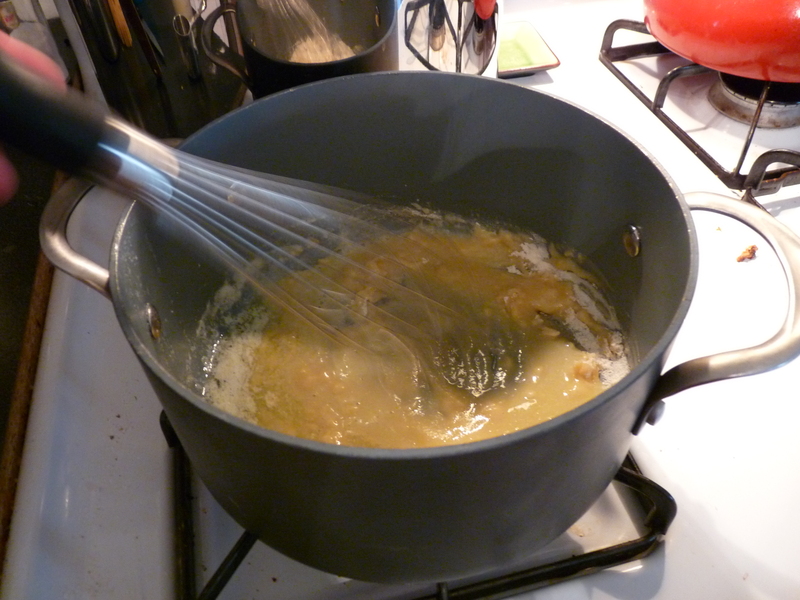 First you want to boil up some salted water for 1 pound of a short pasta of your choice. 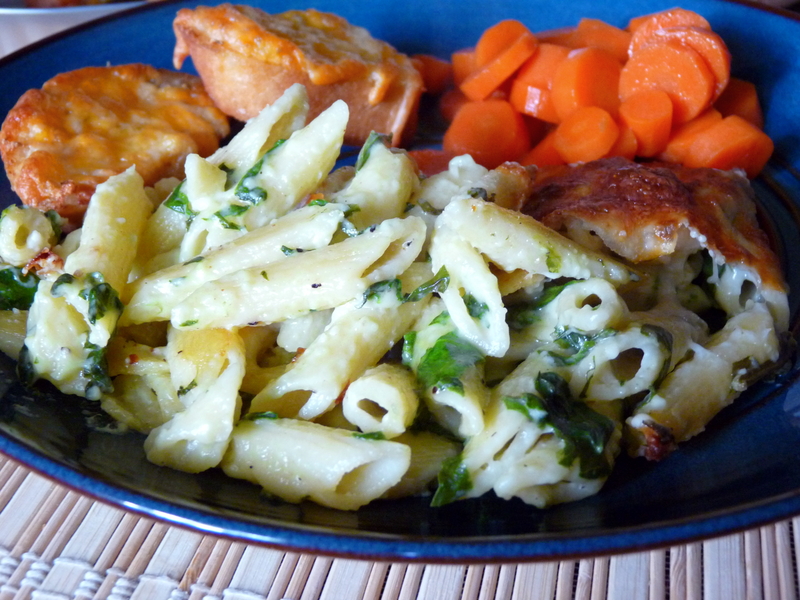 I chose penne, but you can use any short pasta that floats your boat. 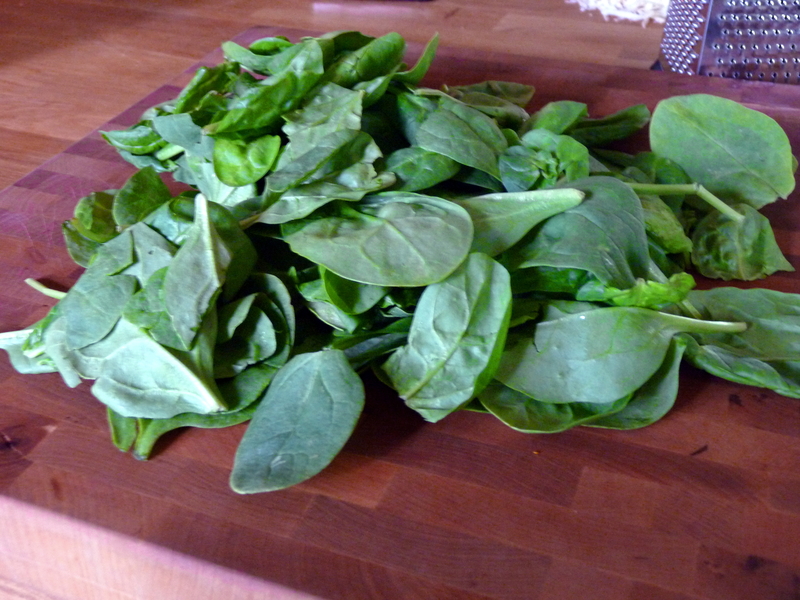 While you wait for the water to boil, get out some spinach. I had a bag of baby spinach that I had used a little of, so this was probably 2/3 or 3/4 of a bag. But if I’d had a whole bag, I would have used it. 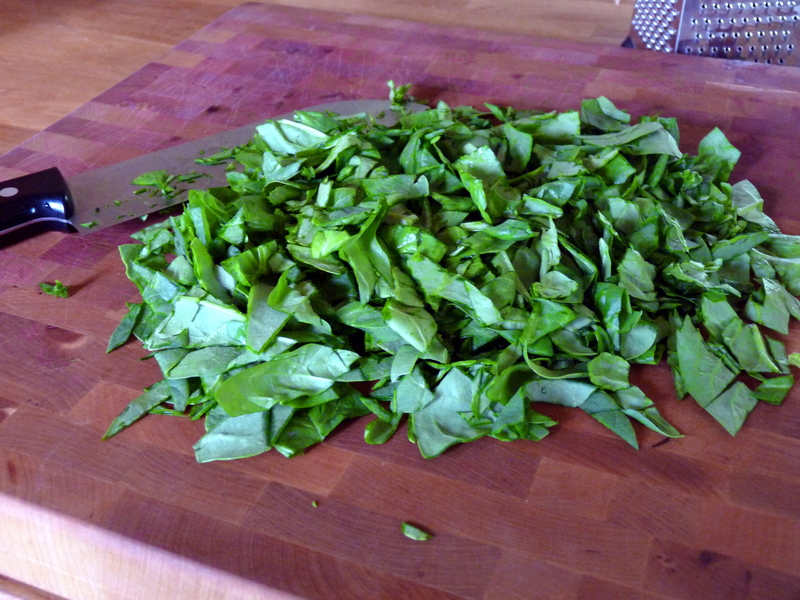 Put the spinach out on a cutting board and give it a rough chop. If you really want to, you can chop it finely or even give it a chiffonade, but I figure it’s going to wilt when you mix it with the hot noodles, so what difference, right? 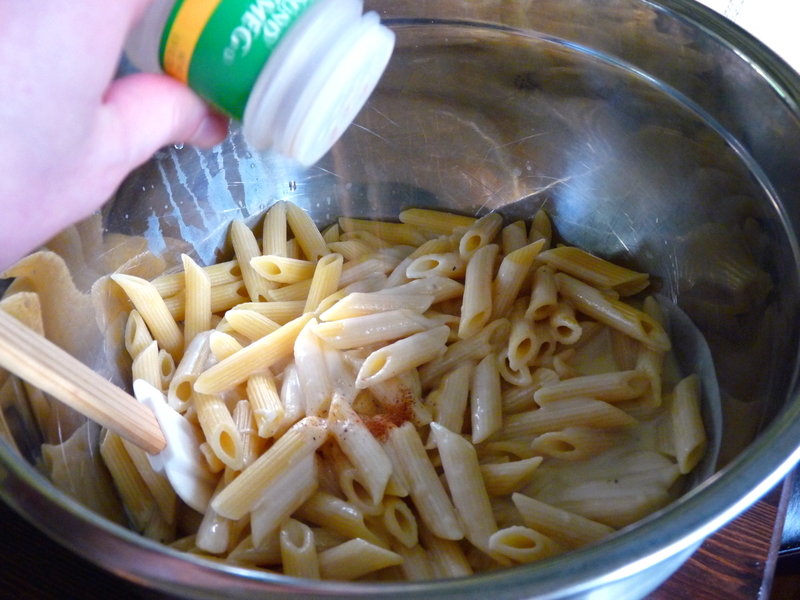 Ok, so when your water is boiling, go ahead and throw in your pasta. Set a timer for the “al dente” time on the box. 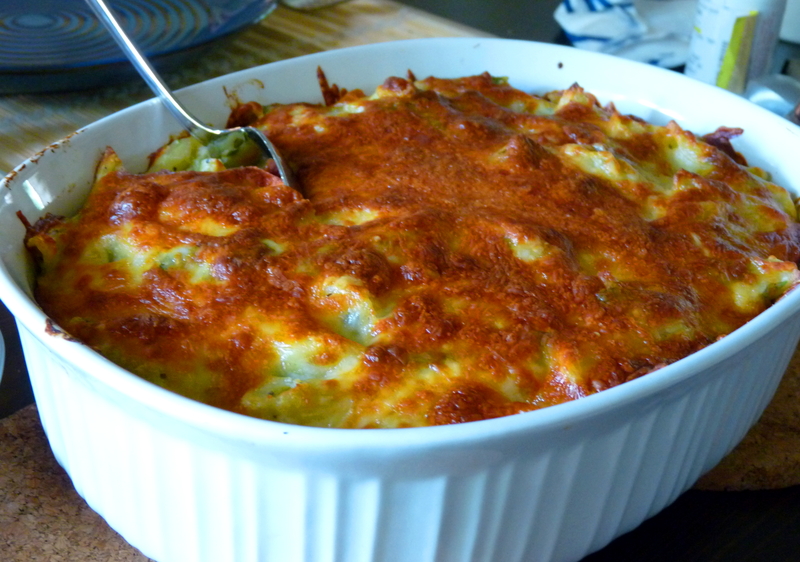 While your pasta cooks, turn your attention to the bechamel sauce we’re going to make. 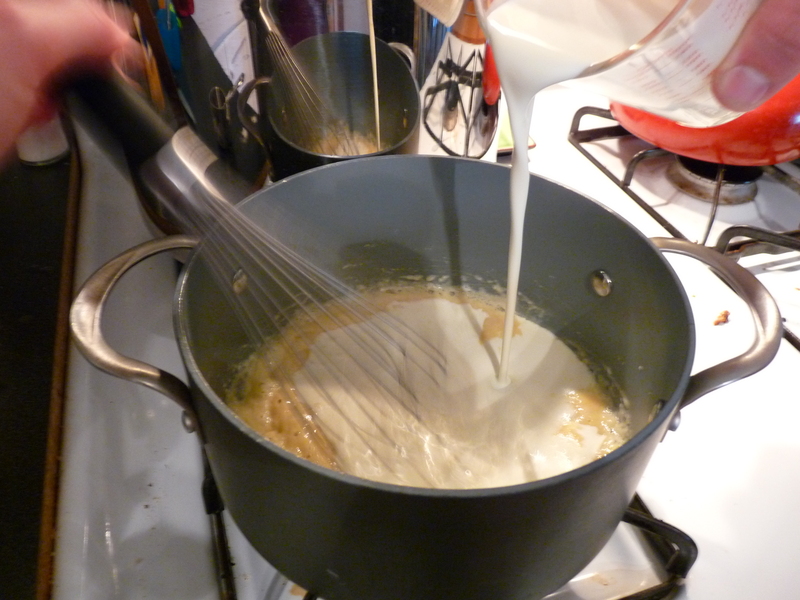 “Bechamel” is a fancy way of saying “white sauce.” It’s basically the same as the alfredo sauce I showed you before, only we won’t put cheese in it. 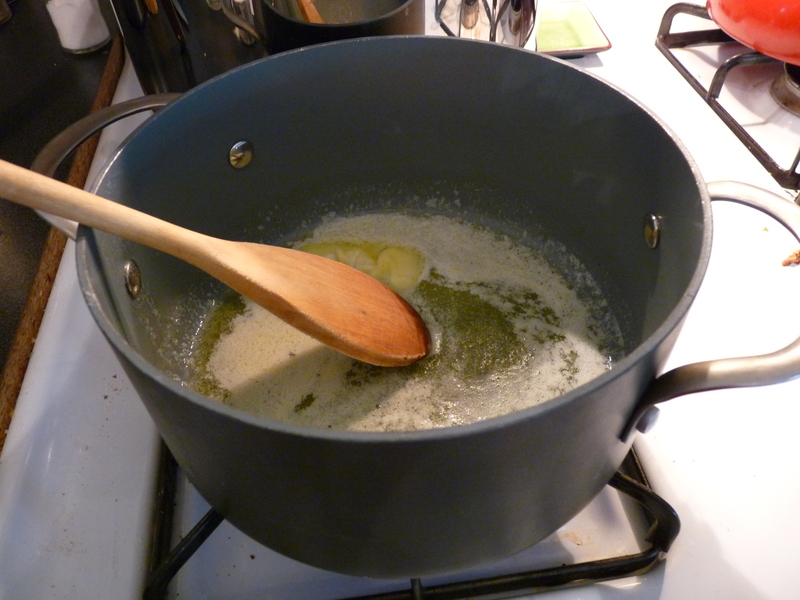 Start by melting 1/4 cup (half a stick) of butter in a saucepan. Whisk in 1/4 cup of flour. 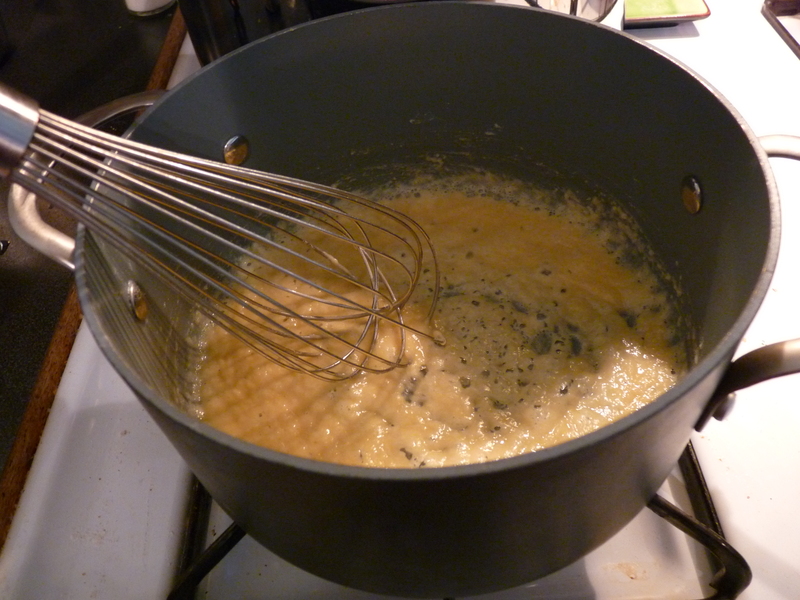 Continue to whisk & cook it until it gets to be a nice golden brown. 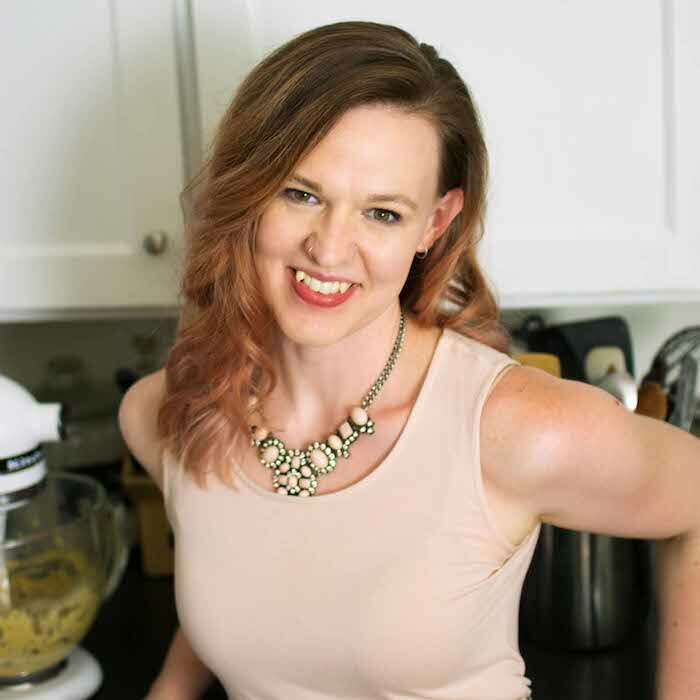 Then stir in 2 cups of milk or half & half or heavy cream or a combination therein, depending on how decadent you’re feeling. For the alfredo, I only used 1 1/2 cups of milk/half & half/heavy cream but since this was going to get baked, I wanted to make sure it retained some sauciness after being in the oven. 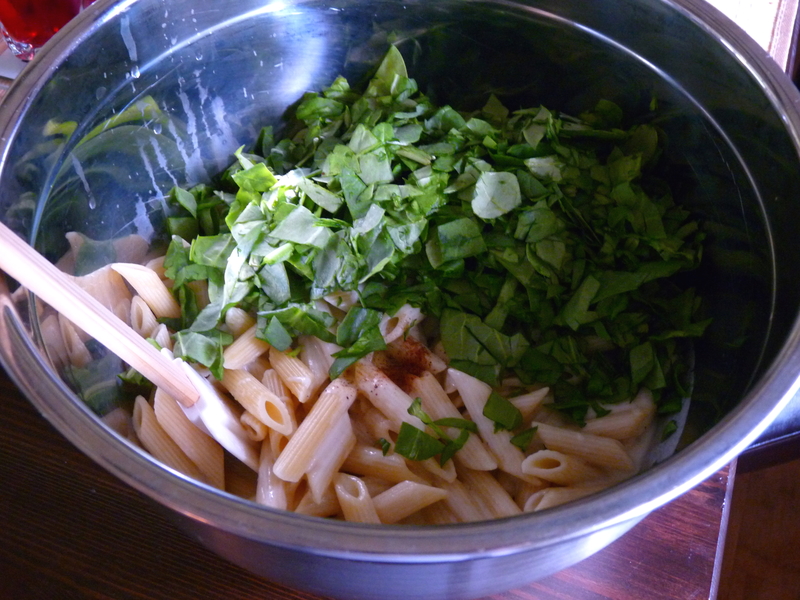 Drain the pasta and put it in a large bowl. Pour the sauce on top, and add some nutmeg. You could really add this to the sauce before putting it on the pasta, but I forgot. Either way, it’s all about the same. The amount of nutmeg you use is really a personal preference. I’d say start with 1/4 tsp. and then go up from there if you’re a nutmeg lover. 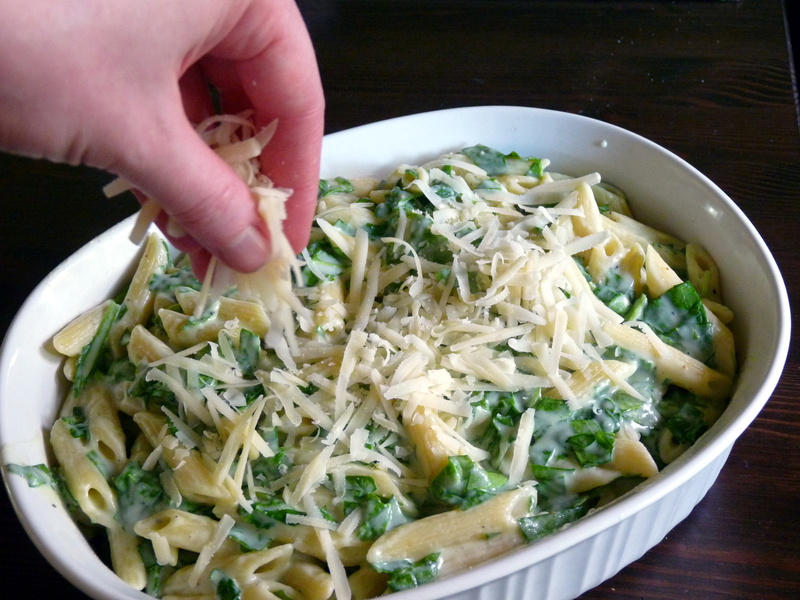 Now throw in your spinach. 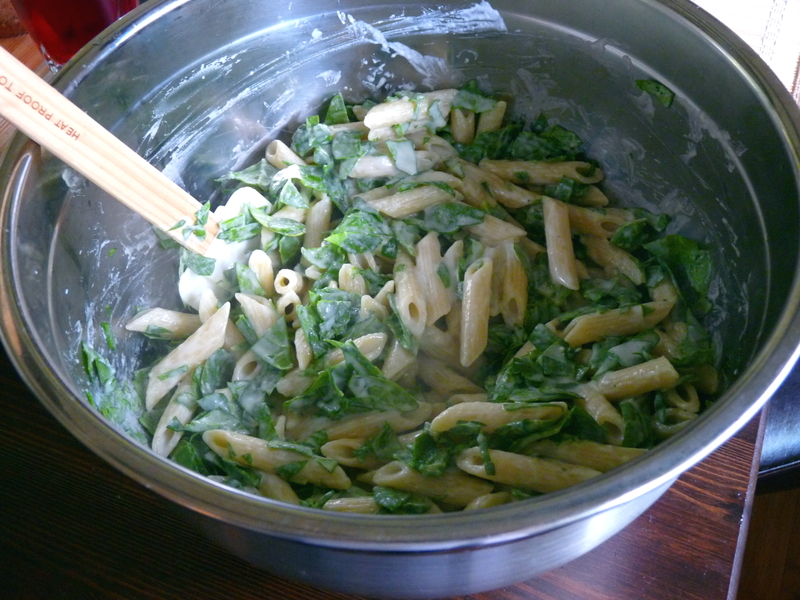 The idea is that once the spinach hits the hot pasta, it’ll wilt. 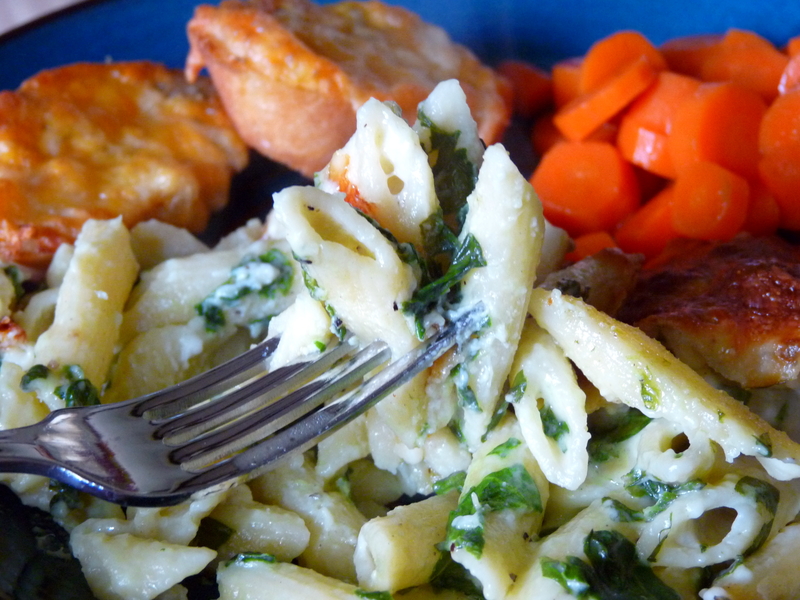 But I was taking pictures and so my pasta wasn’t overly hot when I dumped the spinach in. It still turned out alright. 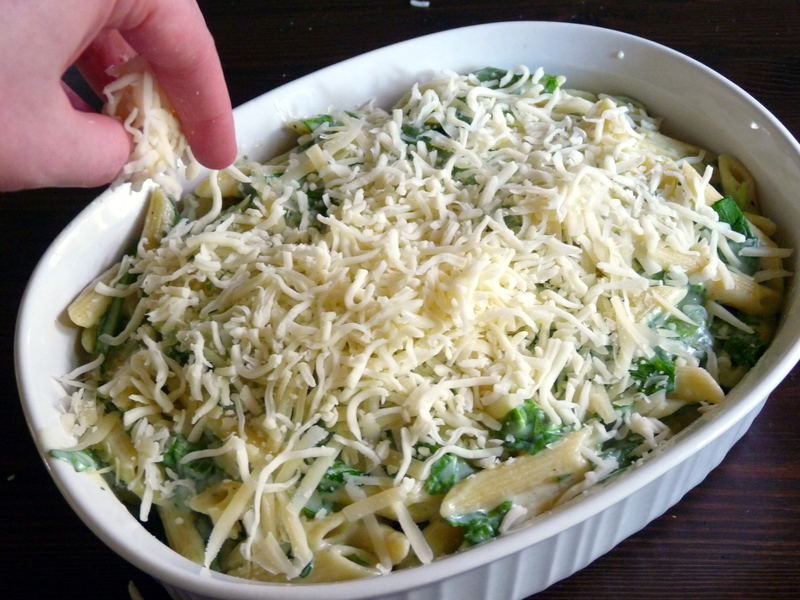 Pour this mixture into a 2 1/2 or 3- quart casserole dish and spread it out evenly. Now we’re going to top this with cheese, of course. What kind of pasta bake would this be without cheese on top? First, with about 1 cup of Parmesan cheese. Then with a cup of Mozzarella. To be honest, I don’t actually ever measure the cheese I put on top of things. I just pile it on until there’s a nice, even layer. Bake it at 400〫for about 20 mins or until the top is golden. 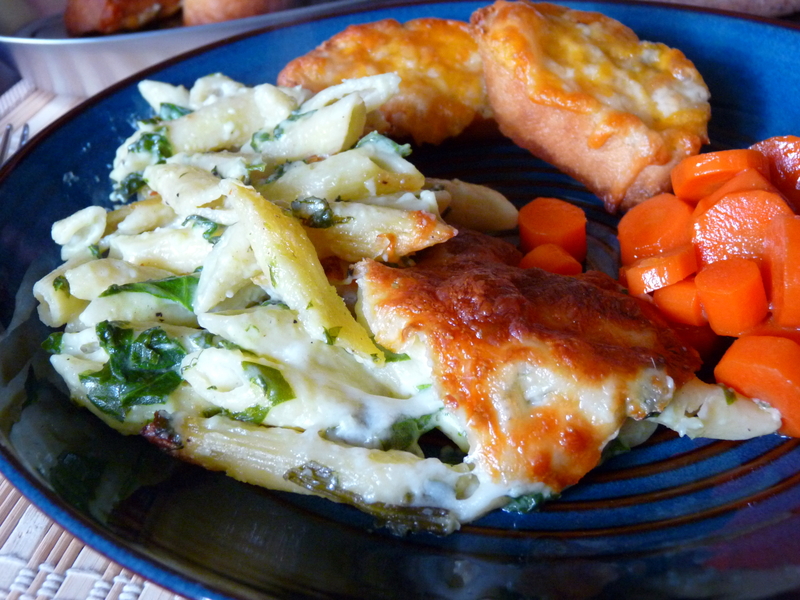 I’m such a sucker for pasta bakes. For real. Oh, and the sauciness. Don’t forget the sauciness. So if you’re looking for a simple, meatless dinner, look no further.